In the western area of historic Kyoto, Japan, lies a place of scenic beauty popular with visitors from near and far. Ride a scenic train or river boat; View a tranquil sculptured pond from a large Zen Buddhist temple; Walk amidst dark bamboo growth reaching so far up the skies that sunlight barely filters in; Cross a beautiful bridge over a leisurely river flow; Feed Japanese snow monkeys whilst taking in majestic hilltop views of Kyoto. 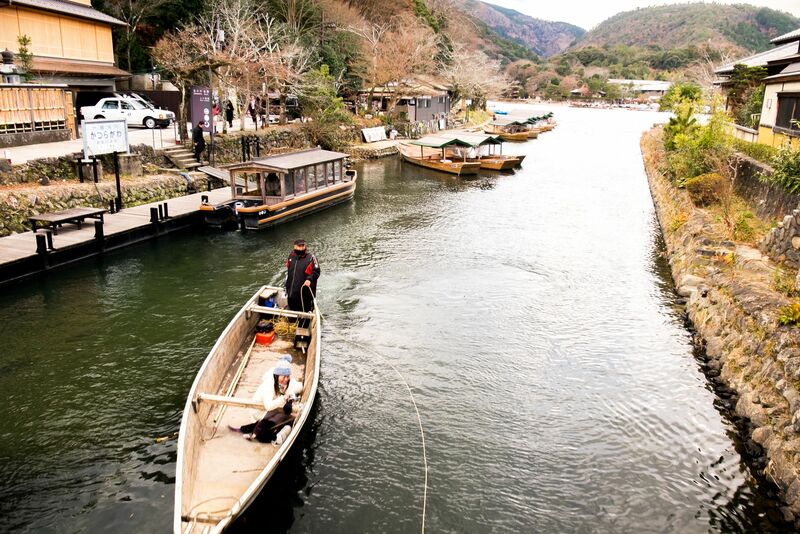 Spending a day in Arashiyama, Sagano, with the family or friends makes for a truly unforgettable experience. Getting to Arashiyama is easily done via the various railway lines to one of the 3 train stations in the area - stations Saga-Arashiyama (JR, 20mins from Kyoto Station), Arashiyama (Keifuku Dentetsu-Arashiyama Line) or Arashiyama (Hankyu-Arashiyama Line). Peak periods to visit Arashiyama include spring's cherry blossom season and fall's color viewing. For the more adventurous looking to travel the groove in style, hop onto one of the Japanese rickshaw rides / tours there. If you have time to spare, start the day off with the scenic Sagano Romantic Train ride (25 minutes one way) and then perhaps the Hozugawa River Cruise (2 hours back to Arashiyama). If you are interested in local temples, visit one of the great Zen Buddhist temples in the area. Tenryuji Temple, a UNESCO World Heritage Site, was constructed in 1345 is located right next to the bamboo forest. 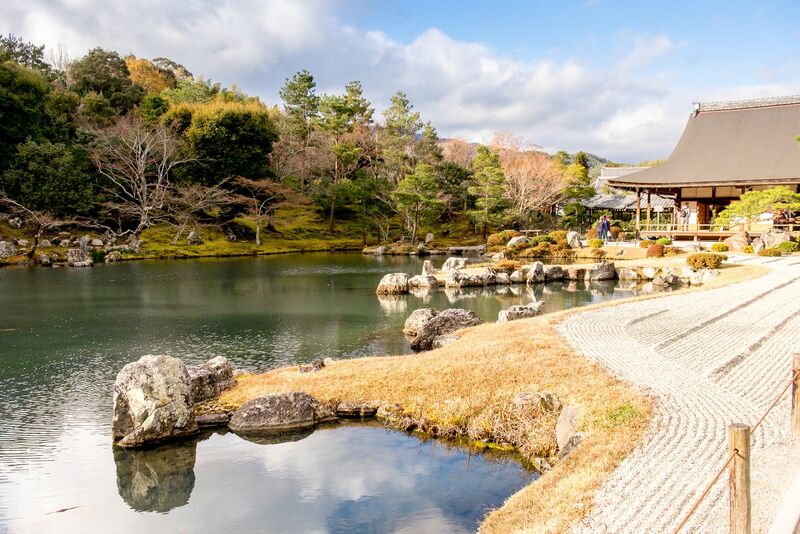 Spend a few minutes taking in the beauty of the specially created garden and Sōgen Pond, the highlight of the temple area. The northern exit leads you to the start point of the bamboo forest. 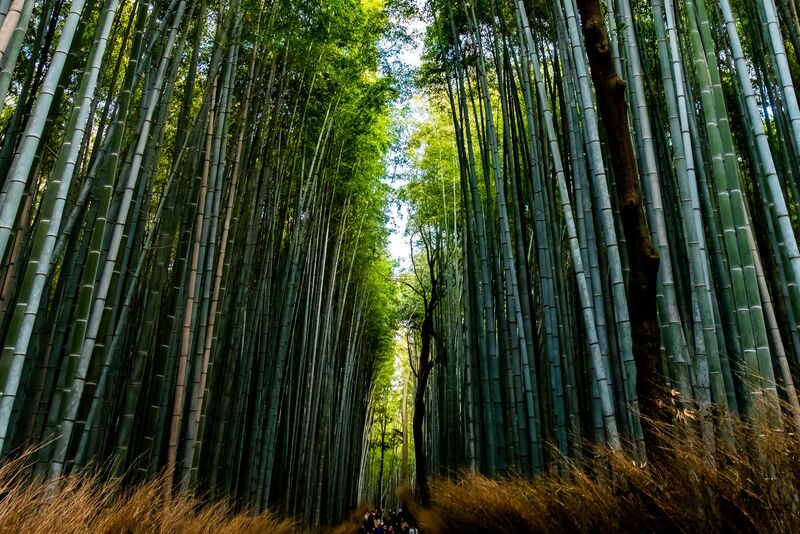 Head deep into the mysterious green of the iconic Arashiyama bamboo forest. Have your camera ready. This photo opportunity is going to be difficult to get anywhere else in the world. The main street between the bamboo forest and Togetsukyo Bridge hosts plenty of shopping and feasting opportunities. Feel free to pick up small items along the way. You may want to save the larger purchases for buying later in the day, after completing the other activities in the area. Togetsukyo Bridge is a 155 meter bridge across the easy flow of the Katsura River. 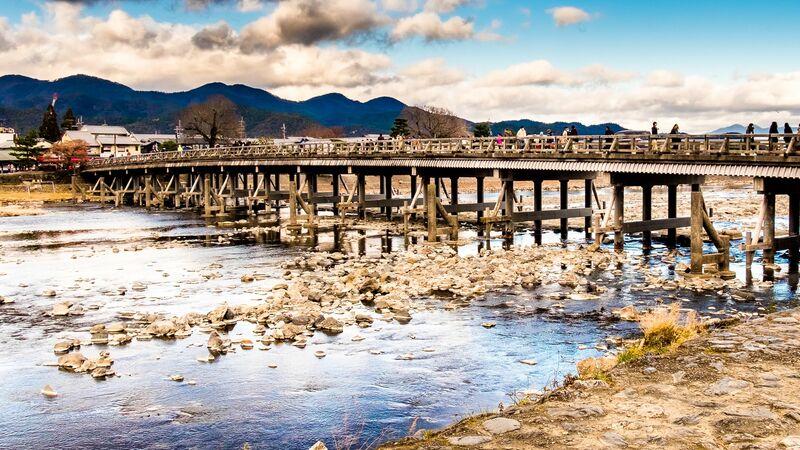 The bridge mirrors the beauty of the Arashiyama area in its design. Crossing this bridge is an enjoyable experience amidst the sound of flowing waters and the sights all around the river. 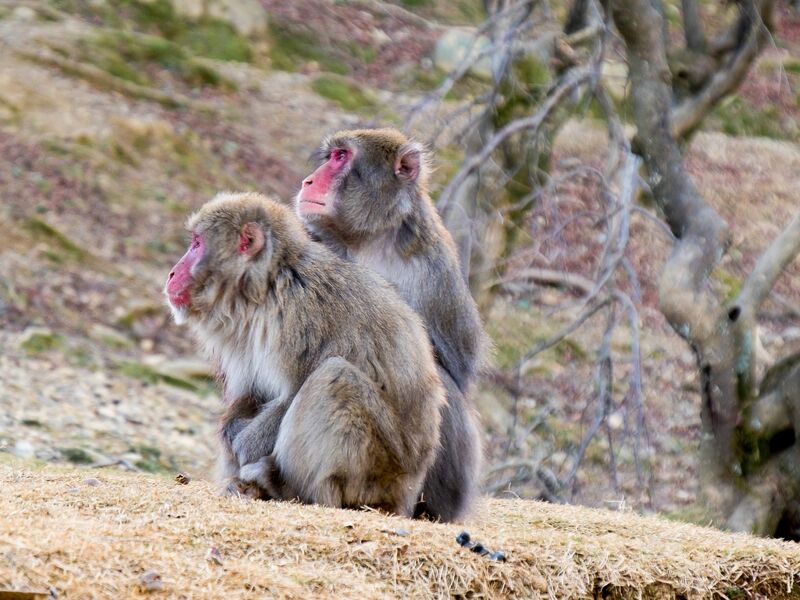 For many, a highlight of a trip to Arashiyama would be a mini hike up the hill (20 mins), spending time with over 100 wild monkeys in their natural habitat at Iwatayama Monkey Park and taking in the views of Arashiyama and Kyoto. 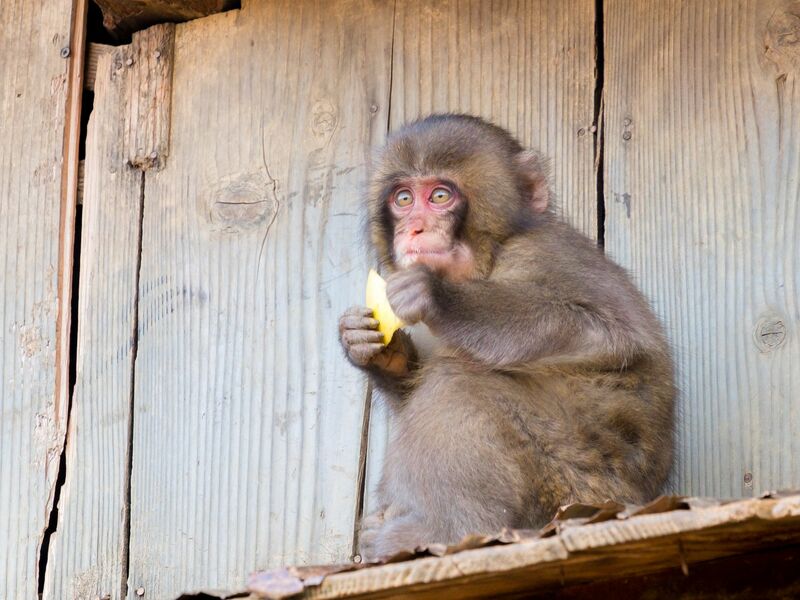 The native snow (macaque) monkeys here are really used be being with people, allowing everyone to get close to them. 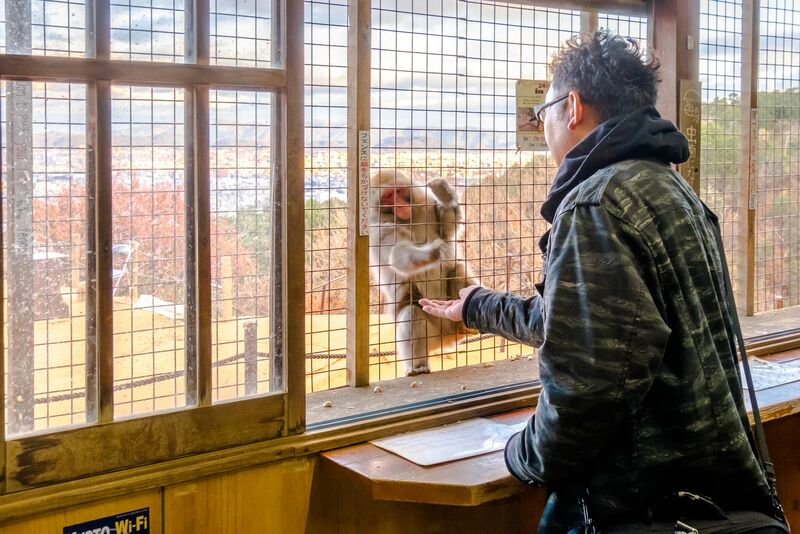 The monkeys are fairly playful too. Do pay attention to the signs and instructions (with regards to the monkeys and your belongings) and you will have a truly special time here. 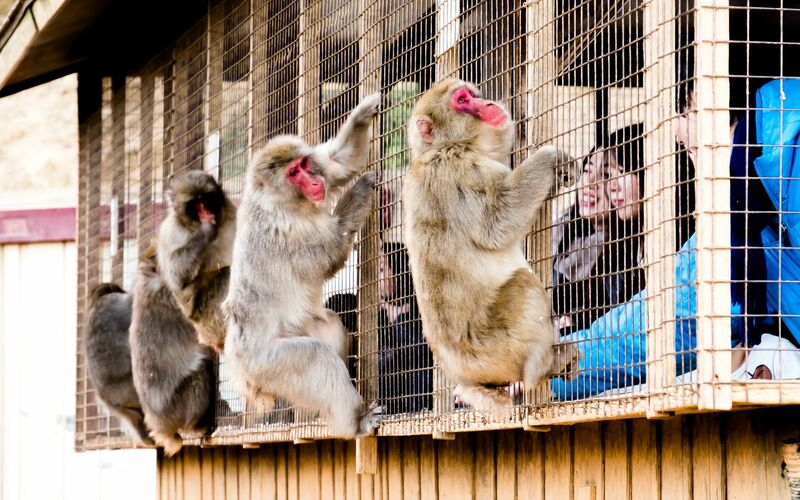 Get into the "cage" and have the monkeys reach in towards you! Back down in town, the kimono forest lights up as the sun sets. This is a good time to take a stroll through almost 600 kimono wrapped pillars of sheer fabric delight.